Choose a cloud ERP that provides solid core CRM functionality—and talks to Salesforce. This report shows you how. When your sales and marketing activities are integrated with the rest of your business, everyone can make better decisions. Establishing this kind of visibility used to mean building complex integrations—or purchasing massive ERP systems that would stretch the budget and IT capabilities of any small or midsized business (SMB). Things have changed. 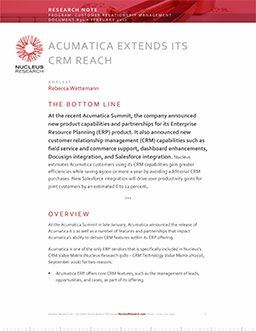 According to Nucleus Research, many Acumatica customers can now meet their CRM needs by using the core CRM functionality provided in Acumatica Cloud ERP — or by using a new Salesforce integration. Learn more in a free report. Which core CRM processes you can manage within Acumatica. How to increase productivity and ability to promise for your field service staff. How Acumatica Commerce Edition accelerates the sales process. Which Acumatica enhancement can increase your manager productivity by 8%. How to give your salespeople a real-time view of inventory in Salesforce. You really can get integrated CRM and ERP without bursting your budget or causing headaches for your IT staff. Get started by reading this report. Get free report from Nucleus!